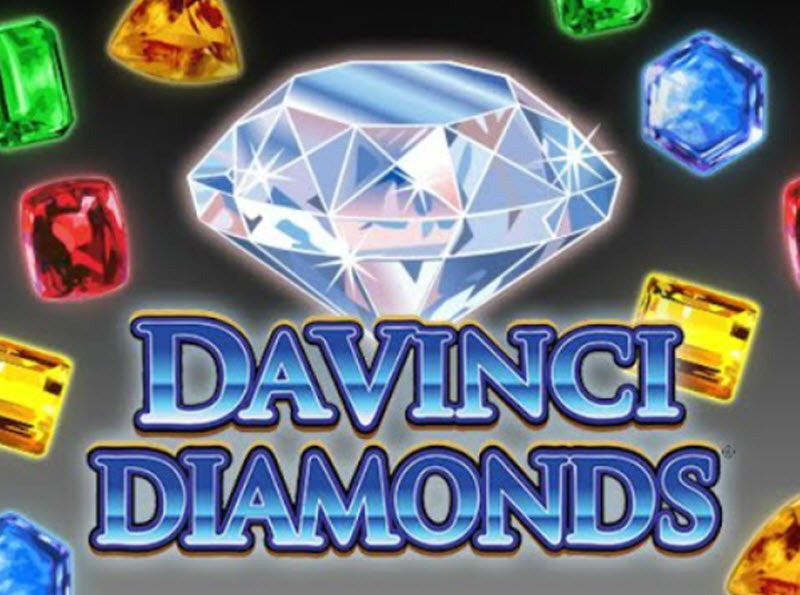 Da Vinci Diamonds is a renaissance inspired slot machine from IGT. It was initially created for brick-and-mortar casinos, but is now available online as well. There are no reels on Da Vinci Diamonds. Instead, the symbols fall down from above and arrange themselves into five columns. There is room for three symbols in each column. 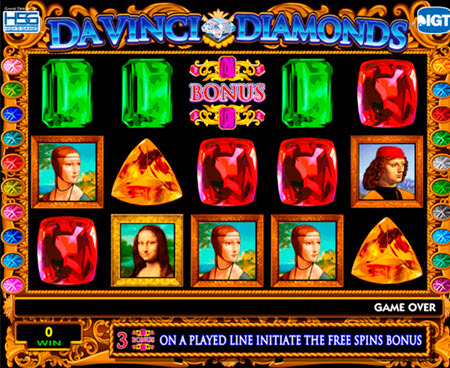 Da Vinci Diamonds is an early example of Tumbling Reels. (If you are more familiar with NetEnt slots, you know this feature as Avalanche). Winning combinations will dissapear after paying out, creating empty spots so other symbols can fall down – hopefully creating more winning combos for you. Regretably, the RTP for Da Vinci Diamonds is low, just 94.93%. This will turn a lot of players away from the slot, since there are plenty of slots available online today with an RTP of at least 96% and quite a few with 97% or more. The theme for this slot is the renaissance. Classic renaissance paintings can appear as symbols, along with precious stones and pearls. Examples of paintings that adorn the reels are the famous Mona Lisa, Lady with an ermine, Virgin of the Rocks, Lasdowne Madonna, Portrait of a musician, and La Belle Ferronnière. You always play with all 20 paylines active. Also, you can’t select coin value or how many coins to bet per payline. Instead, you simply select how much money to bet per payline and that number is multiplied by 20. You can chose the amount freely, you have to chose from seven available options. The wild symbol consists of a ruby and the word WILD. Da Vinci Diamonds has no less than THREE different scatter symbols, and all of them are cut-outs from famous paintings. You need to get 3 identical scatters, anywhere on the reels, to win a scatter win. When a winning combo is formed, the symbols in the combo will disappear, leaving room for new symbols to fall down from above. This gives you a new chance to win something, and it can happen numerous time in a row. The feature is active both in the basic game and during the free spins round. The bonus symbol consist of the word BONUS + two pink precious stones in a gold setting. If you get a bonus symbol on the first reel, second reel and third reel simultaneously, you will be given 6 free spins. Getting only 6 free spins might sound a bit low, BUT the good news is that during the Free Spins Round, it is pretty easy to obtain additional free spins. If you get 3 bonus symbols anywhere on the reels during a free spin, you get 2, 3 or 4 additional free spins. If you get 4 bonus symbols anywhere on the reels during a free spin, you get 4, 8 or 10 additional free spins. If you get 5 bonus symbols anywhere on the reels during a free spin, you get 6, 8, 10, 12 or 15 additional free spins. The cieling for how many free spins you can have in a row is 300! Also, the Tumbling Reels feature is active even during free spins, so you can get a lot of play out of a single wager if you trigger the Free Spins Round. If you like Da Vinci Diamonds but would prefer 40 paylines instead of 20, and a more advanced Tumbling Reels feature, take a look at the slot machine Da Vinci Diamonds Dual Play. This slot also comes with a higher RTP.